Please ask for Aisleen or Amy. Independent HR technology consultancy, Silver Cloud HR, has developed an online tool to help businesses narrow down their options when it comes to choosing a new HR or Payroll system. The Which HRIS? Selector tool has been developed as part of a brand new website (www.silvercloudhr.co.uk) launched earlier this month, and enables users to obtain software recommendations based on number of employees, payroll requirements and business structure (global or national). Helen Armstrong, managing director at Silver Cloud HR says: "With so many options available on the market from a huge variety of vendors, businesses often don't know where to start and there is a real risk of 'settling', or choosing an HR system that isn't quite fit for purpose.". She continued: "As independent HRIS consultants, we help our clients demystify the entire process, as well as guide them through their options from start to finish, but we wanted to provide an initial idea of what systems are out there and their suitability for organisations of various sizes.". Through the new website, HR department heads can also book a free HRIS Health Check, benefiting from the expertise of Silver Cloud's team of HR tech consultants who will audit current systems and processes to identify opportunities for streamlining, before providing recommendations for improvements in all areas. Other new additions to the website include a resource section, request a call-back functionality and a new blog section featuring news and updates from the world of HR, payroll and technology. Based predominantly in London, Silver Cloud HR works globally with clients based in the UK, Europe, Asia and North America. Completely independent from, yet working closely with all major HR system vendors, services include help with HRIS selection, implementation, and project management as well as ongoing HRIS support and training for businesses of all shapes and sizes. To access the new Which HRIS? Selector Tool, visit www.silvercloudhr.co.uk/which-hr-system, or to book a free HRIS Healthcheck, contact the Silver Cloud HR team today. 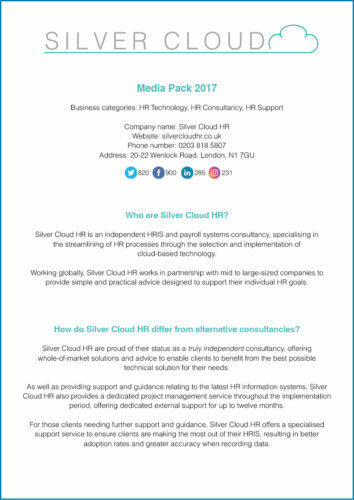 Silver Cloud HR is an independent HR technology consultancy specialising in the selection, implementation and support of HR and Payroll systems across a variety of sectors. Founded in 2009 by managing director, Helen Armstrong, the team consists of 11 HR technology consultants who all, uniquely, share a background in HR. Working with organisations of all shapes and sizes, both in the UK and globally, clients include Ted Baker, Chelsea Football Club, Linklaters, Church of England, Ericsson and Lewisham Homes. As a female-led team, Silver Cloud HR are passionate about supporting the Women in Tech movement and have recently joined the Aspire mentoring programme to help nurture the future generation of HR technology professionals.